In 1986, the United States began striking gold and silver bullion coins to compete with world bullion coins such as the Canadian Maple Leaf, the South African Krugerrand, and others. The value of these coins was intended to be tied directly to their metal value, although in some cases (where mintages were low) a collector market has developed. The bullion value of these coins far outstrips their face value. 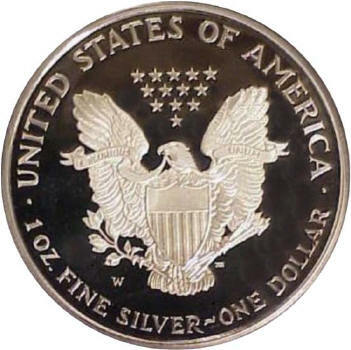 Known as "American Eagles" because of the family of eagles on the reverse, U.S. silver bullion coins are available in Uncirculated and Proof versions, as well as in a number of different sets. Proof coins may be ordered by the general public directly from the Mint. Uncirculated coins are distributed by selected representatives, who then make them available to the secondary market. 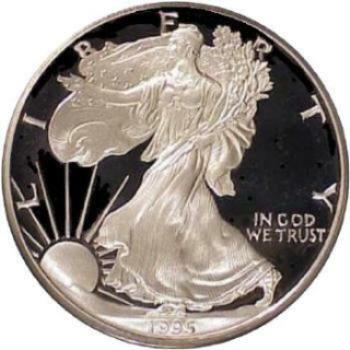 The obverse of the U.S. silver bullion coins follows the artistic design created by Adolphe A. Weinman for the Half Dollars issued from 1916-1947, inclusive. John Mercanti created the reverse design. Each Silver Eagle has a face value of $1 and contains exactly one ounce of pure silver in an alloy of 99.93% silver and .07% copper.